After weeks of not being able to find the back of the net, Montpellier HSC came back from the international break determined to turn their season around. League action returned to Division 1 Féminine after the international break and although the top two teams continued their tussle at the top, the story of the weekend was at the bottom of the table. Montpellier HSC had had a shocking start to the season but they knew that when the international break ended, they would have a chance to readdress their issues and win against bottom-of-the-table FC Metz. They did just that and put eleven goals past Metz, also solving their previously ailing goal-scoring efforts. Swedish international Stina Blackstenius shined with five goals but she was not the only one to rediscover their form in front of goal for Montpellier. Blackstenius started things off with a goal in the fourth minute after Metz failed to properly clear a corner kick away and Montpellier put together a few passes before Blackstenius finished from inside the penalty area. Sakina Karchaoui made it two in the 13 minute as she glided past a defender before beating the goalkeeper from close range. Blackstenius added two more in the 14 and 26 minutes while ​Virginia Torrecilla, Janice Cayman​ (with a penalty) Clarisse Le Bihan and Marion Torrent made it eight-nil before half time. Blackstenius added two more to her overall tally and Sofia Jakobsson got in on the act with the final goal of the game in the 88 minute. Metz have been pretty much hapless from the start of the season and conceding eleven goals to a Montpellier that had been desperate for goals is a clear indication of their season so far. They stay at the bottom of the league and look like they will be early candidates for relegation. Montpellier on the other hand, will have happily welcomed the end to their lack of goals. The win not only pushes them up the table into eighth but it also gives them some much needed self-belief as they look to catch up to the top teams once again. En Avant de Guingamp​ recovered from their draw in their previous match to put three past Lille OSC this weekend. The hosts had to wait until the second half to get a goal but once it came, there was no stopping them. 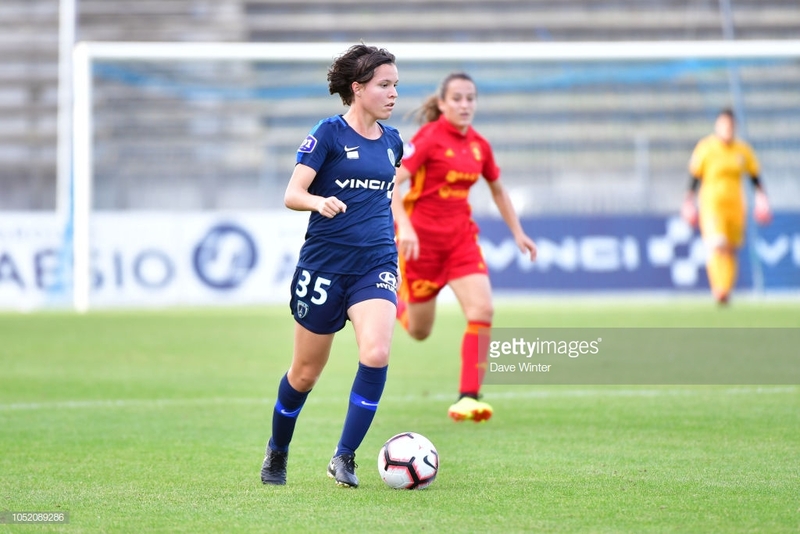 Adélie Fourre opened the scoring in the 50minute when Léa Le Garrec​'s free kick hit the crossbar before falling to Fourre who finished well past the goalkeeper. Faustine Robert made it two-nil in the 77 minute when she placed a cross from Louise Fleury's cross into the corner of the goal from close range. Fleury then got a goal for herself in the 86th minute when a bad backpass allowed her to get to the ball before the goalkeeper and finish into an empty net. With the win, Guingamp moves into fifth and now has three wins in their last five matches. They will be happy with their form right now and will look to stay as far up the table as possible this season. Lille are now winless in five games and slide into tenth. They are five points above the relegation zone but will want to get a win from somewhere soon to avoid getting involved in a relegation battle. Olympique Lyonnais continued to roll towards another league title with a three-nil win over FC Girondins de Bordeaux. Bordeaux have proved to be a tough task for any team in the league this season so far so OL will be happy with the win, especially since many of the players had been away on international duty. The home side got off to a good start when Delphine Cascarino found Amel Majri with a good ball into the box and Majri finished easily at the near post. The second goal of the game came in the 30 minute when Eugénie Le Sommer put Cascarino through to the byline and she picked out Majri again for her fourth of the season. Ada Hegerberg finished things off in the 80 minute when she nicked the ball off a Bordeaux player and curled the ball into the corner of the net. It's going to take an almighty effort to stop the train that is Olympique Lyonnais as they continue to pick up win even when they are not at their best or when they have rested key players. With such a deep squad, they can afford to rotate regularly and still stay at the top of the league. Bordeaux are not as fortunate talent-wise as their opponents this weekend but despite this loss, they are in fifth with two games in hand to everyone else in the league. If they can keep picking up points against the rest of the league, they will put themselves in a great position to finish in this season. Paris Saint-Germain remain right behind OL as they look to topple the current champions. With so many players also coming back from international duty, the home side will be happy with their two-nil win over Dijon FCO. Kadidiatou Diani is having a great start to the season and she got her third goal of the season in the 27th minute after holding off two defenders and racing past the goalkeeper. PSG then had to wait until late in the game to secure the three points and they did through Marie-Antoinette Katoto in the 83 minute who nu-megged the goalkeeper as she netted her seventh of the season. For a few hours, PSG were at the top of the league as they waited to see if OL would stumble against Bordeaux the following day but that was not to be. After seven rounds, PSG remain in second place and will continue to try and stay with OL in case the league leaders drop points somewhere. Dijon slide down into sixth place but will know that games against the top teams will not determine their fates. If they can continue to pick up points against the rest of the league, they will remain in the top flight after being promoted this season. Paris FC got their second straight win away to ASJ Soyaux and show a resurgence under new manager Sandrine Soubeyrand. ​Linda Sällström, who is in contention for signing of the season, got the first goal of the game in the 21 minute after she got on the end of a pass from Mathilde Bourdieu. Bourdieu then got the goal her play had deserved in the 56 minute after a great lay off by Gaëtane Thiney allowed her to go for goal unobstructed. Paris now sit in third after seven rounds and whatever Soubeyrand is doing seems to be working. For a team with the talent that Paris has, third place is the minimum they would expect from the team each season. Rodez AF and FC Fleury 91 could not find a winning goal between the two of them and ended up in a nil-nil draw. This draw means more to Rodez than it does to Fleury as the home side hung on to pick up their first point of the season after six straight losses. Rodez remain in eleventh with a long way to go to get out of the relegation zone but maybe with this point, they will be able to give life to their season. Fleury 91 slide into seventh with only one win in five. They will want to address that quickly before they slide too far down the table.